Cal-Mil 321-10 Classic Clear Dome Display Cover - 10" x 12" x 4 1/2"
Cal-Mil 322-10 Classic Clear Dome Display Cover with Single End Opening - 10" x 12" x 4 1/2"
Cal-Mil 324-10 Classic Clear Dome Display Cover with Single Side Opening - 10" x 12" x 4 1/2"
Cal-Mil 367-10 Classic Clear Dome Display Cover with Single Middle Opening and Door - 10" x 12" x 4 1/2"
This Cal-Mil 325-10-13 10" x 12" shallow black acrylic bakery tray is perfect for serving and displaying colorful cookies, mouth-watering muffins, delightful Danishes, or exquisite eclairs. Made of durable acrylic, you can count on this tray for exceptional resilience to everyday wear and tear for long-lasting use. Plus, its raised edges help prevent unwanted spills! Many styles of bakery tray covers and display risers are also available (sold separately), to best complement the service style of your bakery, cafeteria, or buffet. 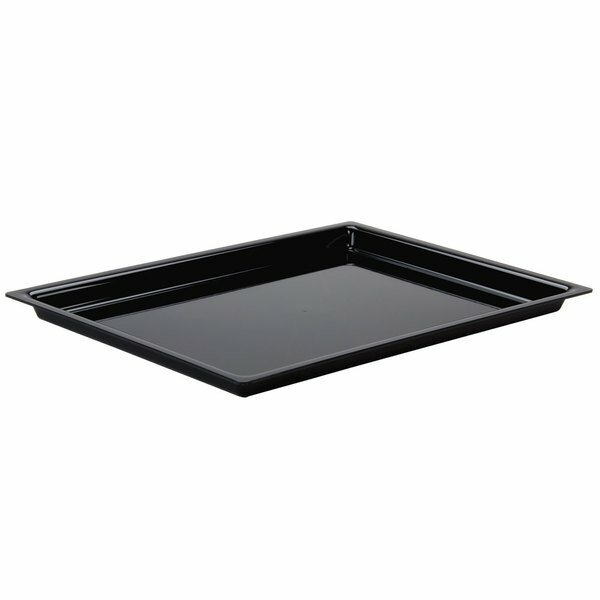 Or, simply use this attractive tray on its own to enhance your existing presentation.